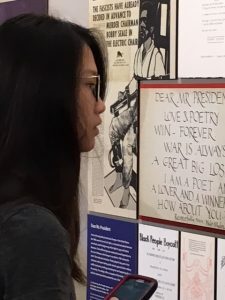 The Beat Generation & the Counterculture: 1940-1975 went on display in the library’s Fran Elizer Exhibit Gallery in the spring of 2018 drawn primarily from manuscript and photograph collections held at Emory’s Stuart A. Rose Manuscript, Archives, and Rare Book Library. The exhibit maps the journey of the artistic movement’s unique influence on American creative expression and countercultural resistance over the course of three decades. 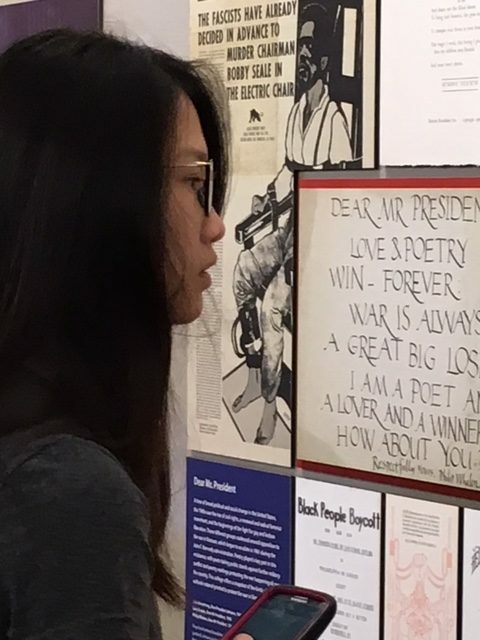 Jessica Fu (left), a freshman pre-business and accounting major from Statesboro, views a poster from the Reimaging Resistance portion of the Beats Exhibit with her cell phone ready to photograph the details of the image for her writing assignment. Right away, Solomon’s AMST 201QW students found connections between the America the Beats traversed and current cultural conflicts reflected in the exhibits. Students wrote responses based on one piece in the exhibition that resonated with them most. Emily Beling (left) listens to the original recording of Ginsberg’s Howl read by Ginsberg himself. 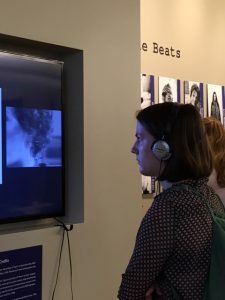 Solomon developed this particular assignment to include something from the Beats due to their intersectional concerns and to allow for critical engagement with the exhibits. “My pedagogical philosophy incorporates getting students outside the classroom, whether that’s a field trip, field work, or service learning. I like to find resources for students to do the contextual work so they can engage directly with material and artifacts.” His recommendation to instructors who are interested in having students use primary sources—“Digital archives are great, but there is something to be said for allowing students to occupy the space of the exhibit or the archive and understand that it’s fun.” And it was FUN indeed! 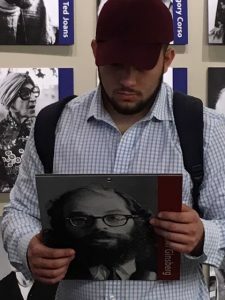 Shawhin Safe ( right) a second-year student from Glencoe, Illinois reads information about Ginsberg and his famously banned book, Howl. What’s the value in exhibits like this to instruction and collaboration? According to Courtney Baron, Oxford’s Head of Library Teaching and Outreach Services, “These collections make fantastic teaching tools because they foster active learning instruction, appeal to multiple learning styles, and inspire inquiry-based research. Faculty interested in incorporating primary sources, artifacts, or digital collections into their teaching should view the Rose Library’s assignments portal for sample assignments and class session configurations. Oxford College librarians can help faculty arrange visits to or from the Rose library to Oxford College for your classes.” Contact Courtney Baron for more information.